This is the first time ever that Samsung will be having a three rear camera smartphone and it’s not even in their flagship Galaxy S-series. Is the tech giant giving us a peak into their next flagship? 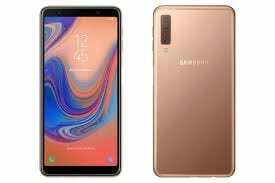 The smartphone has a similar build.material to that of the Samsung Galaxy J6 Plus and Galaxy J4 Plus it was launched with. More of a upper mid-range smartphone, it offers some juicy specs some which you can find below. There’s no denying that the Samsung Galaxy A7 (3018) is quite an attractive smartphone due to the kind of material used in its build. It has a polycarbonate rare covered by glass which makes it look appealing. However, the material used under the glass makes it quite light with a weight of just 168g. It is also very sleek with a slim frame measuring only 7.5mm and an overall simple look. Touting the infinity display, the smartphone is a much better upgrade on to its predecessor. Here you have 6.0-inch sized AMOLED screen which is bordered by minimal bezels adding to its alluring charm. Of course, you can rely on a resolution of 1080 x 2220 pixels to ensure you enjoy the display. There is also the mediocre battery as seen in the Samsung Galaxy J6 Plus and Galaxy J4 Plus. As far as usage is not too intensive, the smartphone should last you till the end of the day. For charging, there is a fast charge featture as well as MicroUSB port rather than the USB Type-C on last year’s model. Featuring a three camera rear combo is a new thing on Samsung’s turf and it is certainly not a new thing because you have a similar setup on the Huawei P20 Pro. It has a 24MP low light camera which is also the main sensor, an 8MP wide angle camera and a 5MP depth focus sensor mostly needed for portrait pictures. A singular 24MP front camera is however positioned up front for capturing decent selfies. Behind the glassy appearance lies a Samsung made mid-range SoC running the day to day tasks. With eight cores, the Exynos 7885 chipset ensures everything goes well on the smartphone with a Mali-G71 MP2 taking care of graphics. You can pick between the 4GB RAM and 64GB internal storage or the other with 6GB RAM and 128GB storage space. Alongside Samsung Experience UI with Android 8.1 Oreo is pre-installed on the smartphone. The 4GB RAM model goes for 120, 000 Naira while the more expensive 6GB RAM option is about 145, 000 Naira depending on the deal and your location.